So, I suppose we should talk about Donald Trump at some point. Trump might just be the most famous conspiracy-monger in the world at the moment. He’s flirted with, if not outright endorsed, a wide variety of conspiracy theories, ranging from run-of-the-mill birtherism to old-school Clinton Death List claims to the new hotness that is the vaccine-autism connection. A few people have noticed that Trump seems to buy into an odd combination of theories about Obama’s time at Columbia University. Officially, Obama attended Columbia from 1981 to 1983 as a transfer student from Occidental College in California; after graduating he went on to study law at Harvard. Since 2008, people (mostly on the right) have raised doubts about Obama’s time at Columbia – they’ve speculated that he was admitted as a foreign student, proving he wasn’t born in America; that he had awful grades and only got through university because of affirmative action policies; that he was turned into a Marxist Manchurian candidate by the constant barrage of radical leftist teaching; or even that he never attended Columbia at all. The official story is a carefully constructed lie, meant to cover up the sinister truth. You’ll notice that these theories – bad student Obama, foreign student Obama, indoctrinated student Obama, non-student Obama – are not all compatible with one another. Maybe he was a foreign student with bad grades, but it’s not possible that Obama got bad grades at a university he was never a student at, or that he wasn’t admitted, but was also admitted as a foreign student, or never attended lectures at Columbia, but was radicalized by the left-wing lectures. But, somehow, every so often you see the contradictory theories being pushed by the same people. Trump’s friend and supporter, Wayne Allyn Root, seems to have provided the raw material for a lot of these theories: he thinks that Obama might have been registered at Columbia, but certainly never attended classes, but was also brainwashed by those classes. Trump suggests that Obama never went to Columbia – he “came out of nowhere” and none of his classmates remember him – but also finds it likely that his records from Columbia would show a foreign birthplace, if they haven’t been deleted. In a baffling tweet (even by Trump standards) he urged the hackers of the world, as long as they’re going around hacking stuff, to find out more. This fits into an established psychological pattern. In a study published in 2012, my colleagues and I showed that there tend to be positive correlations between beliefs in contradictory conspiracy theories. The more someone believes that Osama Bin Laden was dead long before 2011, the more they believe that he was still alive after the media pronounced him dead that year. The more someone believes that Princess Diana was killed by business enemies of Dodi Fayed’s family, the more they believe she was killed by the British secret service. And, probably, the more someone believes that Obama was never admitted to Columbia, the more they believe that he was admitted there as a foreign student. Why is this? Is it because people who buy into conspiracy theories are dumb and crazy? No, almost certainly not. It’s because the conspiracy theories are usually pretty vague and are based more on general suspicion than on specific evidence. If you’re suspicious that something is going on and that the truth is being covered up, then many different (and perhaps contradictory) alternatives will seem more likely. You can see this pattern arise in computational models of belief consistency. ECHO, an excellent model by Paul Thagard, showcases this very well. We can use ECHO to construct a belief network made up of various propositions and bits of evidence that support or contradict one another; the network will then decide on the basis of those relationships which proposition or propositions seem most likely. Research has shown that ECHO does a pretty good job of predicting the outcomes of jury trials and scientific controversies. We can use ECHO here by constructing a simplified network to represent the Obama/Columbia question. For the purposes of the model we’ll assume that there are three mutually contradictory theories, all of which explain the evidence equally well. However, we’ll add “suspicion of a coverup” as something that links with and supports both conspiracy theories. A JavaECHO simulation of the Columbia question. The distance of the conventional explanation from the Special node indicates that it has been rejected by the model. Now, hit Run – see what happens? The resulting weights show that both conspiracy theories are accepted despite the fact that they contradict one another, because they both have an underlying suspicion supporting them. 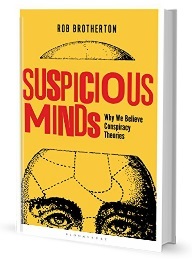 Networks with more lopsided evidence might favour one conspiracy theory over another, but usually, if that suspicion is there, both conspiracy theories will still seem more likely than the conventional explanation. This demonstrates that even beliefs in contradictory theories can turn out to be correlated with one another. If you read the links from earlier in the post, you might notice that piecing together who said what is difficult. A lot of these ideas, whether they come from Trump, Root, Breitbart, or elsewhere, are phrased as innuendo or “just asking questions.” There’s some deniability there. Root, for his part, now says he never claimed Obama wasn’t registered at Columbia or didn’t graduate (though he’s a poor writer if that’s not what he was getting at). I don’t think this vagueness is completely a rhetorical tactic, though- I think it reflects a genuine uncertainty about what’s going on. People don’t often commit to a hyper-specific version of some conspiracy theory. More often than not, the suspicion is all there is. This entry was posted in Social psychology, World events and tagged conspiracy theories, obama, psychology, trump, USA. Bookmark the permalink. An either-or worldview. Either you with us, or you’re against us. Hell and heaven. Left and right. Coke and Pepsi.